Blue Rider excels as a personal document, reflecting on the sweet and hard times of everyday life, but it's also a document that perfectly represents the plight and joy of the truly independent musician. Time has proven that the internet isn't so much a democracy for music and other art as it is a borderless sharing space, an antique mall for the brand new. You claim your space, you shop your wares and, unfortunately, you can get largely ignored. The acts that rise above aren't lucky, or better, they have other resources. The thing about this big sharing space is that, as much as it has increased accessibility to music, it hasn't changed the channels that bring that music to us much. Sure, we're less reliant on record labels -- especially big media conglomerates -- but there's still a system in place. Bands still need publicity teams and well placed products. That placement has become electronic, not physical, but it's not much different. To place a premiere or a review or an album stream in any of the most highly read locales is tricky. It gets much easier if you're touring nationally, which gets much easier if you've got a booking agent, which sometimes gets easier if you're on a more recognized label or if you've got a publicity team that can get your music placed where it matters. This isn't inherently bad, not by a long shot. But it's worth remembering that, despite universal access, there are still gate keepers, and they are fallible. Artists slip through the cracks, others get through untested. The path of the truly independent musician is a difficult one. And yet it's the path we've found Zachary Cale on for the past decade or so. He's an independent musician out of Brooklyn who, with help from friends, runs a small record label called All Hands Electric. It was built to put out music his friends -- including excellent bands like Woodsy Pride and Plates of Cake -- were making. And Cale's own work has flourished, as his last three records -- 2008's Walking Papers, 2011's Noise of Welcome, and his new album Blue Rider -- have seen him grow exponentially as a songwriter and performer. They also, taken as a whole (and including his 2005 debut, Outlander Sessions) show a road hard travelled, but a traveler never done in by the ruts and snags along the way. If the Cohen-esque, deathly folk of Walking Papers signified and end and the hazy sunburst of Noise of Welcome signaled a new beginning, Blue Rider finds these markers breaking down. That everything is constantly in motion, everything is constantly moving forward, even if the past is behind it like a long shadow. Here, it's not about the end or the beginning, but the person adrift between those two ever widening poles. 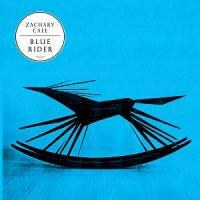 Cale finds self-definition on Blue Rider, and that this raises even more questions and makes things even murkier is one of this finely helmed record's greatest achievements. Musically, the album retreats from the gauzy brightness of Noise of Welcome and into something more solitary. The focus is on Cale's voice -- grown sweeter, more subtle over the years -- and his wonderful work on the acoustic guitar. There are other instruments here, other flourishes, but they serve more to emphasize that singular center rather than flesh it out. Opener "Unfeeling" builds on bittersweet rolls of finger-picking. Faint electric guitars glide fills over that dusty foundation, but it's Cale's voice that cuts through the negative space around the track. He talks about the return of "that cold unfeeling gloom". He's advising here, cautioning someone against the temporary fix of, say, throwing some liquor down" over the problem welling inside. It's a somber start to the record, one that recognizes lingering demons right away. But it also ends on a bright note, with Cale keening out "I'll be here when you wanna open your eyes." It's a call for comfort but also a criticism of blind clinging to darkness, the kind of darkness so much folk music romantically aligns itself with. The album, meanwhile, trudges hopefully forward. "Dollar Day" is sweetly exhausted with hard work -- you can see the parallels with, say, running a small label, organizing short tours, etc. -- but never collapses under the strain. Instead, it's all about "another dollar for the can to keep me on the path that leads to you." After the troubled "you" of the first track, Cale seems to turn his eye to love, to a "you" that makes it all worth it, to a "you" that is a destination because they are a home. In "Blood Rushes On", that love is "at arm's length," but not being kept at a distance. Rather, love's close proximity is constant motivation, even as that same narrator squares with a distant brother and father, the latter who may question a life in, say, music (another rut in that less-traveled road) but who, in the end, will "recognize the me in you." For all the moving forward here, the past still hangs around. Before "Blood Rushes On", Cale drafts a letter to his yesterdays in "Dead Shadow". The song takes stock of regret, but only to leave it behind. The guitar chugs out a percussive thump, atmospheric instruments echo into space, and Cale challenges that past because though "[he's] still stuck with you", the past itself is also "still stuck." Personal history is a presence here but not a hindrance. In fact, Cale seems to pointedly reference his own musical past here on "Wayward Son" when he sings that "in your fist are your walking papers" and in naming the closer "Noise of Welcome". These nods to his early work don't fall back on past success but instead re-contextualize them. Walking Papers dealt with endings, but "Wayward Son" is about what comes next, about constant movement that may lead some kind of personal hope. And, in "Noise of Welcome", Cale -- in his most echo-treated voice on the record -- claims "the sky is heavy but I'm more than ready" before his voice clears and he calls to that "you" again to "come dance with me", to share just that moment of joy. So, yes, there's a long past to Blue Rider. This Rider, though, is heading away from the sunset, and letting the growing dark behind him take all that baggage with it. This is bittersweet stuff, sure, but it's also profoundly resilient. It acknowledges the past but leaves it out of the present. It's not about the hard-travelled road, it's about the resolve of the rider on it. Blue Rider excels as a personal document, reflecting on the sweet and hard times (the guitar shifts from lilting picks to snare-like snaps, the other players perfect foils for this back and forth) but it's also more than that. It's a document that perfectly represents the plight and joy of the independent musician, of the artist constantly knocking on those gates, hoping for that welcome noise on the other side. Cale, like many others, still hasn't gotten his answer, not the big one he deserves. But there's still time to fix that, and Blue Rider is exactly the kind of record that would soundtrack that welcoming party perfectly.